According to yoga philosophy, it is the flexibility of the spine, not the number of years since you were born that determines a person’s age. It is easier to track the chronological age of a person, time and date of birth. But, what about your biological age? Or your age of maturity? Meet my grandmother, Eleanor. At 95 years young, she still exercises her body and mind, incorporating yoga into her daily life. If you ask her, she might not call it yoga, but she has maintained flexibility, balance, and elasticity in her spine. She has increased circulation, removed tension from the body and mind, and maintained length in her spine. Not to mention, her soul swells with positivity and her mind seeks clarity. Like a bottle of vintage wine, the practice of yoga provides your body + mind get better with time. With practice, we embrace vitality and eternal well-being, leaving behind the characteristics of old age. A longer, more fulfilled life can be possible by following yogic ways of health and maintenance prevention. Remove the dangers of internal disease and habits leading to degeneration, and we naturally live longer. Stand straight, and energetically lengthen through the crown (top) of your head. Stand tall into your feet, ankles to touch, hands by your side with palms facing forward. With an inhale, rise on to your toes and lengthen your arms overhead, palms to touch overhead. With an exhale, stay lifted and lengthen even more though the crown of your head. 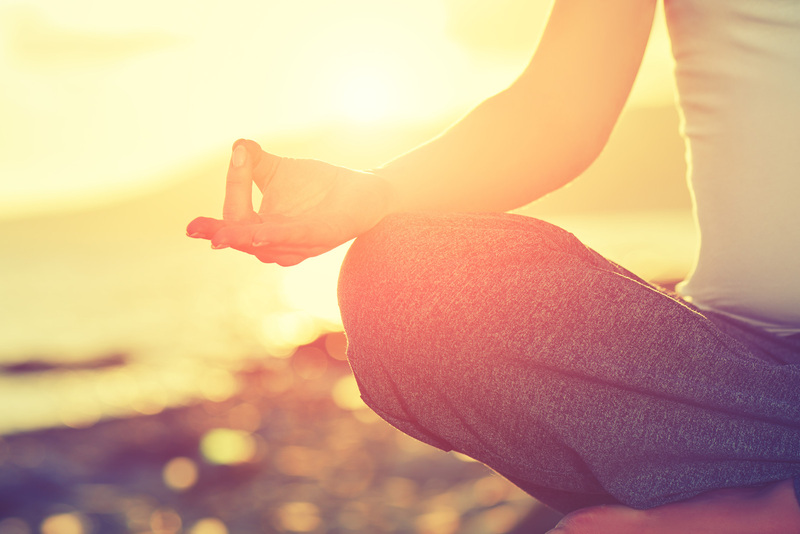 Stay for one complete breath, lowering slowly back to your heels as you exhale. Stand in Tadasana, hands on hips. Exhale and bend forward from the hip joints, not from the waist. As you descend draw the front torso out of the groins and open the space between the pubis and top sternum. 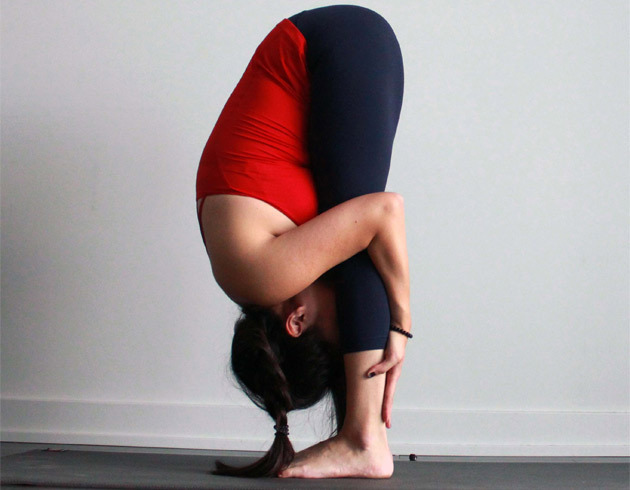 As in all the forward bends, the emphasis is on lengthening the front torso as you move more fully into the position. If possible, with your knees straight, bring your palms or finger tips to the floor slightly in front of feet, or bring your palms to the backs of your ankles. If this isn’t possible, cross your forearms and hold your elbows. Press or beside your the heels firmly into the floor and lift the sitting bones toward the ceiling. Turn the top thighs slightly inward. With each inhalation in the pose, lift and lengthen the front torso just slightly; with each exhalation release a little more fully into the forward bend. In this way the torso oscillates almost imperceptibly with the breath. Let your head hang from the root of the neck, which is deep in the upper back, between the shoulder blades. This posture lengthens the hamstrings, calves ad hips while strengthening the knees and thighs. It stimulates the liver and kidneys while activating the parasympathetic nervous system. Calms the brain and helps relieve stress and mild depression. In order to age gracefully, we must challenge our balance regularly. Perform half moon on the right side with you left hand resting on the left hip. Inhale, bend your right knee and slide your left foot about 6 to 12 inches forward. At the same time, advance your right hand forward, beyond the little-toe side of the right foot. Exhale, press your right hand and right heel firmly into the floor, and straighten your right leg, simultaneously lifting the left leg parallel (or a little above parallel) to the floor. Extend actively through the left heel to keep the raised leg strong. Rotate your upper torso to the left, but keep the left hip moving slightly forward. Bear the body’s weight mostly on the standing leg. Press the lower hand lightly to the floor, using it to intelligently regulate your balance. Lift the inner ankle of the standing foot strongly upward, as if drawing energy from the floor into the standing groin. This posture strengthens the abdomen, ankles, thighs, and spine. In addition, it stretches the hamstrings, calves, shoulders and chest while improving coordination. When in a balancing pose like this, the brain lights up like fireworks, improving mental clarity. The ocean is a source of revitalizing energy. Constantly in motion, waves of pure energy travel miles upon miles to reach the shore. These waves of energy are absorbed into the body and mind when surfing, resulting in many health benefits. Surfing is great cardiovascular exercise, using mostly upper body muscles to paddle and leg muscles to guide the board. Once you pop up, leg muscles engage to steer the board and maintain balance. But the health benefits of surfing aren’t just physical. There are also the mental benefits. Surf stoke reduces stress, and often translates to a more laid back attitude. Surfers are always playing in the ocean and this play helps you stay young. There are two things that I love – being in, on or near salt water and yoga. And with summer approaching, it is the perfect time to marry these two loves with stand-up paddleboard (SUP) yoga. Now, let’s pause here for a second and address all you doubters that said, “I have a hard time doing yoga on solid ground, let alone a floating board.” Fear not my yogis, SUP yoga is much more than just yoga. It’s believing and pushing yourself to find out what you are truly capable of doing! It’s opening your senses to the natural world that surrounds you and embracing it’s beauty. It’s surrendering to something much larger and more powerful than yourself. It’s learning how to let go of control and laugh at the little things. You don’t need to be an experienced Yogi or Paddler! The sport of stand-up paddling is beginner friendly and simple to learn. Plus it is accessible to most. To practice SUP Yoga, you don’t need to know how to do elaborate arm balances or inversions. In fact, the only thing you need to know is how to find a slow and steady yoga (ujjayi) breath. You don’t need to wear a bathing suit! Dress in what makes you feel most comfortable, preferably synthetic (non-cotton) clothing. Yoga clothes are totally acceptable. Be mindful to wear sunscreen and prepare as you would for hot weather activity. Secure your sunglasses, hat, and anything else that you don’t want to lose to the bottom of the sea. You may not fall in or even get wet! The boards that I teach SUP yoga on are wide, fat, and stable. The surface of the board sits high above the water and has a comfortable, soft deck pad that acts as your yoga mat. The 11ft yoga board is plenty long (most yoga mats are 6 ft long) and the 30 inches of width (most yoga mats are 24 inches) provide an awesome surface to practice a full, comprehensive yoga sequence. Depending on the conditions, and how daring you get, it is totally possible to go through an entire practice and stay completely dry. With that being said, part of the experience is falling, especially on a hot day. So, don’t be afraid to fall and remember to laugh when you do! You know that feeling when you rise from savasana? Multiply that and add sunshine, salt air, and the sound of sea birds in the distance. Need more convincing? Once your body begins to relax and soften into your SUP board, it finds the natural rhythm of the salt water moving beneath you. The result? Complete calm, peace and ease. Embrace your open mind and sense of humor! 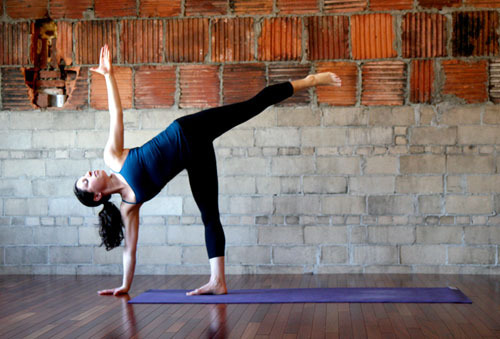 There will be poses that you struggle with on the board that might otherwise be easy for you in a studio! Don’t be surprised as this is part of the fun and challenge of it. SUP yoga requires a steady breath, steady gaze, and concentration – meditation in motion. Because of this, we approach this practice playfully and with a sense of humor.